A Brighouse team full of confidence bit off more than could chew at Four Fields in round three of the competition. Ovenden, who ply their trade in a division higher than Rangers and are unbeaten this season, took an early lead. Rangers then contributed to their own downfall as they conceded three penalties on the trot and were pushed back to their own line. The Ovenden back line capitalised. Rangers rallied and centre Paul Fairhurst went over in the corner but this spurred Ovenden, who increased their lead before half time. Rangers looked uncomfortable throughout the game and never got to grips with the conditions and the sloping pitch. Then an innocuous tackle left the Ovenden scrum-half writhing in agony with a suspected dislocated arm. This held the game up for 45 minutes whilst an ambulance was summoned. Rangers made little impact on the resumpion with Steve O’Keefe’s second half try the only consolation. 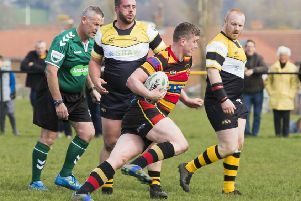 Brighouse return to league action at home to Queensbury A on Saturday (2.0) and will hope to consolidate their league position. Brighouse Ladies RL team, established in 2005 and playing out of Brighouse Sports Club atRussell Way, is looking for recruits. The ladies team were originally a ‘winter’ team but moved across to the RFL and summer rugby approximately four years ago. The reasons for the switch included better playing conditions, less pitch closures and some funding offered by the RFL. The winter of 2014-2015 saw the Ladies enter a one off team in the WARLA League to help with the progress and development of the influx of new and inexperienced players that had been recruited during Summer 2014. However, it was agreed by the committee that the ladies sahould revert to being a summer team. Summer 2015 found the Ladies playing in the Plate Final against Leigh Miners but Leigh were the better team on the day. The team has recently recruited Craig Taylor to be the head coach with Sarah Kennedy as his assistant. The pair carry a wealth of experience, with Craig recently taking his Batley Under 16 Girls on a very successful tour of Australia. He is currently coaching the Ladies Yorkshire Team that plays in the County of Origin game this Sunday against Lancashire. Sarah is a long standing player of Brighouse Ladies but is currently recovering from an injury she picked up playing for Great Britian Armed Forces in July last year. The Ladies train on a Thursday at 7pm with games on Sundays. If you are interested in playing please contact Kelly on 07749 301702 or email kelby12002@yahoo.com for more information.